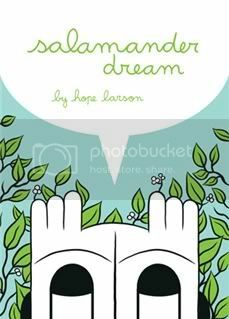 Salamander Dream is about Hailey, a young girl who likes to play in a forest with a creek running through it near her house. During her visits to the forest, she befriends Salamander—a magical creature, or possibly an imaginary friend, who tells her wonderful stories. This book chronicles Hailey’s friendship with Salamander over the years. We watch her change, grow up, make other friends, and visit the forest less frequently. But until the day when she comes to say her final goodbye before moving away, she always does come back. I came across this charming book completely by chance: I was on a quest to find comic books by women to read in July, and I was using this list to guide me. I clicked on the link to this one because I liked the title, and I wound up falling in love. Don’t you love randomly finding something that turns out to be great? Hope Larson’s style is very unique. Salamander Dream has less text than most of the comics I read, but it’s perfect just like that. Some of the moments Hailey and Salamander spend together reminded me of the silent strips that Calvin & Hobbes sometimes had. Which is a good thing, as my love for Calvin & Hobbes knows no bounds. This book has a very different sort of mood—it’s more whimsical than a humorous, really—and it's possible that nobody other than me will see the connection, but what can I say. I loved the silences. I loved the art, which is summery and dreamlike. I loved how well the book captures the bittersweetness of growing up—the secret spaces of childhood, which you know you’ll have to leave behind. The story takes place entirely within those spaces. A lot is merely implied, and Hailey grows up outside the pages. But every time she returns to the forest, we see how time has passed, how she has changed. When I say the story is bittersweet, I don’t mean it romanticizes childhood. Hailey is excited about growing up, meeting new people, seeing new places. But time passing inevitably means there are moments that will never return, and no matter how much you’re looking forward to the future, there’s some sadness in that. I actually read Salamander Dream twice: the first time it only took me half an hour, but the second time I took my time. I would recommend reading it slowly, as a lot of its charm is in the details. 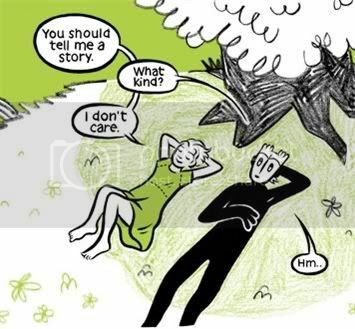 This was Hope Larson’s first graphic novel, and it began as a webcomic. The good news is that it can still be read in its entirety online. Hope Larson has another two books out, and I can’t wait to get my hands on them. Her newest one, Chiggers, has an enthusiastic blurb by Gene Luen Yang. How can I resist? And now a question: as exciting as clicking links randomly and finding great books is, it's also good to have a little guidance, and I very much trust your recommendations. So please tell me about any comics/graphic novels by women that you think I should read. Thank you in advance! Goodness, but that style is interesting! It reminds me a little of American Splendor, a little of Where the Wild Things Are and a little of childhood art projects. Post Script: If one is allowed to plug Web comics, let me put my oar in for Tuna Carpaccio P.I. It's part noir, part Looney Tunes-inspired insanity and entirely fun. I'll have to try this out online! :) Thanks for the link! This sounds (and looks) thoroughly enchanting. I don't read graphic novels often and I imagine that you have read The Complete Persepolis? If not, that read that. There have been a number that Claire @Kiss a Cloud has reviewed recently that have caught my eye. Oh, I very much like the looks of this...I think I'm charmed already! I'm sure you can guess what I'm going to suggest, huh? Yep, The Essential Dykes. I'm just so convinced you'll love it, Ana. How cool is this? This book sounds beautiful. I've never read a comic or graphic book before, this is the perfect chance to see if I like it. Thanks for the link. Loren Eaton: Webcomics totally count! Thank you for the link. Speaking of which, I need to catch up on No Rest for the Wicked. Are you familiar with that one? One of my favourites. Eva: I hope you enjoy it! Claire: I have, yes, and I absolutely loved it! The other Claire's review of The Impostor's Daughter caught my eye too, but sadly I don't think that one's been published yet. I'll keep it in mind, though. Violet: You're welcome! If you don't enjoy it, though, remember that it isn't actually that representative of what can be done in the medium :P It's quite different from most of the comics I've read. Also, dear everyone who's read this post so far: let us all pretend that the horrible misplaced comma I've just edited out was never there. IT WAS A TYPO! Aya, looks really good too, Ana. I read recently that there will be a new Persepolis to take into account recent events in Iran, which excites me. sounds like a fun comic. I'm going to have to check it out. I like gns with little dialog sometimes. I love the pictures in it. They remind me of a book I read as a child - The Moomins. I don't know why as they don't look alike - it just does. I have yet to read a graphic novel, but I hope to some day soon. This one sounds interesting, and I'm drawn to the colors and the illustrations. Thanks for the review! What a terrific find. The drawings are fantastic! This looks great! I love it when I make a great book find, it makes slogging through all the terrible ones worth it! I also like the style of the drawing in this one, it seems really crisp. Nymeth, I hadn't heard of it, but looking at it I think I need to check it out. 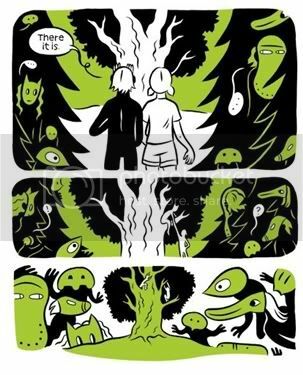 It looks like a great send-up of Grimm's Fairy Tales. Random Hope Larson factoid: she is married to Bryan Lee O'Malley, of Lost at Sea and Scott Pilgrim fame. They are the coolest drawing couple ever. Have you heard of Digger by Ursula Vernon? I've been meaning to read it, but haven't found a print copy yet. It's available online at http://www.diggercomic.com but I've read enough to know I'd like a print version to hold. I just finished reading The Impostor's Daughter, which I loved and highly recommend (even though it's not out yet!). I did the same thing: read it once pretty fast, to read the story and then a second time to savour the images more. I'm not used to reading graphic novels (or memoirs, in this case)! I also want to know about other graphic novels/memoirs by women; the only two I know of are Persepolis and Fun Home by Alison Bechdel, neither of which I've read yet. I love Calvin and Hobbes too...in fact, Calvin lives in my house!! My youngest son!! The drawings are great and this sounds like a very cool comic to pick up!! I love this little book. What great comics. It reminds me of the early color printing in books for children. I still have a lot of old books with two color ink in our school library and the kids find them "boring". Or so they say. I'm not even going to try to recommend a graphic novel to you because I'm pretty sure every one I've read is one you've recommended on your blog. But I'm adding this one to the wishlist because it just sounds so amazing. "a magical creature, or possibly an imaginary friend" -- I'm sold! Thanks for letting us know that this is online. My library doesn't have it and I can't wait to read it. Ooh, this sounds fun. I will have to check it out. Claire: It does! And that's such great news about a new Persepolis. I'd love to hear her take on recent events. Marie: Me too! Sometimes the art says all that needs to be said. Anna: I hope you do give them a try some day! Bermudaonion: Aren't they? I really fell in love with her drawing style. Zibilee: It does! :) And yes, I agree. Loren Eaton: Exactly! Lots of fairy tale references, and great artwork and storytelling. Kiirstin: Coolest drawing couple ever indeed! I hadn't heard of Digger, but it looks like something I'd really enjoy. aviannschild: The Imposter's Daughter definitely sounds like a great one! I loved both Persepolis and Fun Home. I hope you do too! Another one I'd recommend is We Are On Our Own, which is a WW2 memoir. Very beautiful and moving. Staci: I named my youngest cat Calvin :P I guess Hobbes would have made more sense, lol. wisteria: Yes, the style was very reminiscent of childhood, which of course fit the story perfectly! Kim: I hope you enjoy it! another great review. it sounds interesting, I like the graphics. "Charming" and "whimsical" and a comic book by a woman -- sounds good to me! I'll have to track this one down. This one sounds so good. "I loved the silences" says so much in so few words. I have read so few graphic novels, and even fewer by women. Fun House is about the only one that comes to mind. You are already familiar with Persepolis and Fun Home. American Widow by Alissa Torres is supposed to be very good. Haven't read it yet, but am looking forward to it. I really like the style of this and I know what you mean about the silences. The hwole point of graphic novels to me is that they don't need to be filled with text. Thanks for the recommendation, Nymeth. I obviously read your review too quickly the first time around, because I somehow missed the link to the list of comics by women! Thank you for that!